You are here: Home / Best Practices / What’s the best number of Heart Rate and/or Power Zones in our classes? What’s the best number of Heart Rate and/or Power Zones in our classes? If your objective is to communicate (sell) the value of either Training With Heart Rate – or – Training With Power, teaching your class using Three Zones will be the most easily understood, accepted and remembered… here's why. There were three little pigs, three blind mice, Goldilocks and the three bears, Three Musketeers, three wise men and the Three Stooges. 1st, 2nd, 3rd – who ever remembers (or cares) who came next? This copy writing blog explains the Rule of Three very well in the context of effectively communicating ideas. It all comes down to the way we humans process information. We have become proficient at pattern recognition by necessity, and three is the smallest number of elements required to create a pattern. This combination of pattern and brevity results in memorable content, and that’s why the Rule of Three will make you a more engaging writer. I'm confident you can add a bunch more to this list, which kind of makes my point. All of our brains are hard wired to create and retain patterns of three concepts… not four, five, six or seven – three is the magic number. Sally Edwards understood The Rule of Three. Her three heart rate training zones concept called Zoning is designed to appeal to as many people as possible. Please note that I didn't ask; What's the most accurate/precise/correct number of HR or Power zones? My question was; What's the best number of Heart Rate and/or Power Zones in our classes? Cameron Chinatti with Stages Indoor Cycling says the answer is 7 Power zones. So does Joe Friel, Dr. Andrew Coggan. Chris Carmichael appears to use five. All super smart and knowledgeable people to be sure. Administered properly to a committed endurance athlete, 7 power zones is probably the most accurate/precise/correct number of HR or Power zones for them to train with. But 7 Power training zones is too many IMO for our classes filled with Club Athletes. 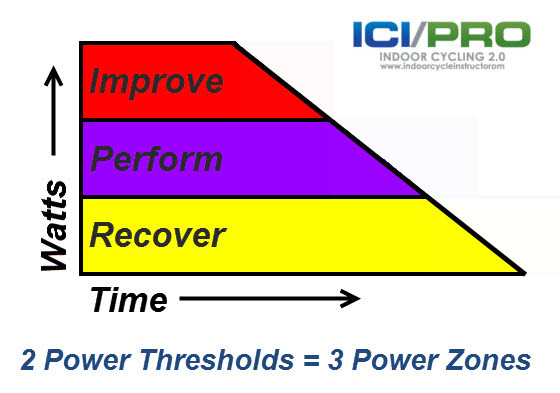 The ICI/PRO Power Training Zones follow The Rule of Three. I'll follow up with more detail later this week. Thanks again for coming back to the basics. Thanks John, I agree with the simplicity and clarity of this approach. For the vast majority of those coming to indoor cycle classes, the hour workout can be a blur of music, sweat and motion (3). Too many variables thrown into that mix only lead to confusion and result in them “checking out”. 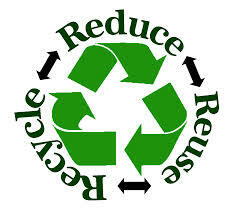 Simple clear goals make it easier. This is a bit counter however to the 5 Heart Rate Zones that many facilities use. I’ll be interested in the details coming next. Eli – great question and I had every intention to elaborate on this yesterday, but got caught up with my post about the cycle sculpt class I taught. We teach for the same chain and I’m excited to explain how I do this asap.